Since January 1, 2015, the new Triman logo must be affixed to recyclable products that fall under a sorting instruction. A provision that also concerns cosmetic product packs, which are part of household packaging. 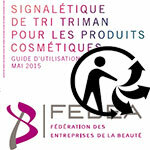 To answer the (numerous) questions that this logo raises, the FEBEA has developed a guide to using the Triman, for cosmetic companies. Reminder of the regulations (Decree No. 2014-1577 of 23 December 2014 on the common signage of recyclable products that fall under a sorting instruction, published in the Official Gazette on 26 December 2014), conditions of application, recommendations for packaging cosmetic products, examples of logo affixing on products, on leaflets or on websites: all these themes are in the summary of the User Guide on Triman sorting signage for cosmetic products, which the FEBEA has just published. Comprehensive, practical and concrete, this 30-page guide simply answers all the questions raised by this new regulation, particularly in small and medium-sized businesses and SMEs for which the FEBEA is particularly intended. The Guide, in PDF format, is free download on the FEBEA website .